We've been in a series of a study of God's healing Grace. We've seen that our Father in Heaven is a good God. We've seen that we should be focused upon Christ and not our imperfections. Surely this is good news. Yet, there still begs the question what about if a believer has sinned? Would a believer who is in sin still be able to receive healing? Some may be thinking don't the Scriptures say if we are in sin we can't expect to receive from God? Don't our sins cut us off from God's hand of blessings? There are three Scriptures that clearly state this. Let's take a look at these passages and see if I've missed it in preaching Grace. If I had not confessed the sin in my heart, the Lord would not have listened. Psalms 66:18 NLT. Proverbs 28 also states if we don't confess our sins we won't prosper. With all these passages, what are we to do? Are we only able to receive if we have a "clean slate"? Are we destined to only be able to receive from God when our conduct and speech are completely perfect? Hasn't the message of Grace revealed we don't confess our sins in order to be forgiven? I suppose these passages prove our detractors correct, right? I suppose they were accurately describing the Radical Grace "message", as an end time deception, correct? Before we go that far let's check with the Lord Jesus Christ, the person of Grace first. What did He do when it came to sins and receiving Healing? 1 When Jesus returned to Capernaum several days later, the news spread quickly that he was back home. 3 four men arrived carrying a paralyzed man on a mat. 4 They couldn’t bring him to Jesus because of the crowd, so they dug a hole through the roof above his head. Then they lowered the man on his mat, right down in front of Jesus. 8 Jesus knew immediately what they were thinking, so he asked them, “Why do you question this in your hearts? 9 Is it easier to say to the paralyzed man ‘Your sins are forgiven,’ or ‘Stand up, pick up your mat, and walk’? What was Jesus attitude to present sins and the receiving of healing? Jesus is the answer to both. He healed Him and forgave Him. 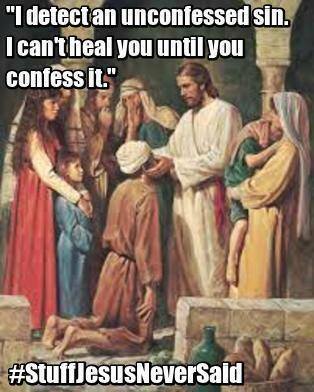 Jesus didn't tell this paralytic, "hey, when you get your heart right and stop all this sin, I'll heal you!" Noticeably absent is Jesus telling this man "your sins caused this condition in your life." Some may be saying, you're now ignoring those other passages. No, I want to rightly divide them. I see these passages being addressed to the Children of Israel, who were abiding under the Old Covenant of Law. This Covenant was in fact based upon, do good get good and do wrong and receive bad things. The prophets were preaching the guidelines and parameters of that Covenant to Israel. In truth, Jeremiah the very one who taught that sins hinder God from blessing, later on, prophesies the New Covenant. Well, brother, I think you're preaching "greasy grace" and "sloppy agape". What about Christians who openly rebel against God's Word and Commandments? I suppose God gets real angry and He turns His face away from them. He places sickness and disease upon them. He places poverty and lack upon them. He places the judgment of that sin upon them. He heaps the curse upon them and allows them to die spiritually. Oh wait, didn't the Lord Jesus Christ experience all of this on Calvary? Didn't Jesus suffer through all of this and much more and declare "it is finished?" So why would God put all this upon believers who've sinned when Jesus already paid the price in full? God our Father, has faith in the Finished Work and once for all time sacrifice for sins. God honors that sacrifice. He doesn't put judgment and suffering on us when we sin. Jesus already paid for our sin debt in full. God isn't withholding anything from us, because our faith is in Christ and His Finished Work and not our own goodness. What about the notion that tradition always brings up about unconfessed sins? Certainly, if we conceal our sins, we experience an interruption of peace, because it erodes our confidence. Love doesn't lead us to hurt others or ourselves. When we allow the light of God's love, mercy and kindness and Grace into our situation freedom and deliverance abounds. As far as receiving forgiveness, this is where the disconnect exists. Religious tradition can't grasp the amazing, over the top, too good to be true, but true good news of Grace and the New Covenant. In Jesus Finished Work, He paid the full price and penalty for our sins. God said under the New Covenant, our sins, and iniquities He will remember no more. This is why we don't confess our sins in order to be forgiven each time we sin. The reality is we are already forgiven. We confess our wrongs because we are already forgiven. I confess I am the righteousness of God in Christ each time I blow it. If we are forever forgiven, how then could God be the one withholding healing if we sin or blow it? It is this religious double talk that erodes confidence in the Finished Work and faith to receive what Grace already purchased. Religion says God has forgiven our sins because of Calvary, but if you sin God punishes that sin and either makes you sick or withholds healing because of your sins. Throughout Scripture, we see the forgiveness of sins and healing connection. Psalms 103, Isaiah 53, 1 Peter 2:24, James 5:14-16, 3 John 1:1-4, When you know you have been forgiven once for all time, no mess up or foul up or sin can hinder you from receiving. The enemy and religion seek to remind you of your sins when you are in need of healing. The accusations arise, "surely, you don't believe you're going to receive your healing this time? Look at your behavior, look at your attitude, just listen to your words..." The enemy seeks to condemn and accuse you, when you need healing or when you are asked to pray for another who needs healing. In order to have bold confidence, look not upon your own goodness, or faithfulness or obedience. Instead, set your heart and eyes upon the Lord Jesus Christ and His perfect obedience, and Finished Work. Place all your trust in that work and that work alone. Jesus purchased our healing and forgiveness in that Finished Work. Stand boldly and confidently, without shame or reproach in His righteousness and faithfulness and receive healing. In summation, Jesus already took the full punishment for sins. Sins and wrong doing, therefore, don't hinder us from receiving from God. It is not that God is "rewarding" bad behavior as religion sees it. It is that God is honoring the work and once for all time sacrifice of His Son. If God honors the Finished Work, so should we. Set aside the religious double talk and open wide the gates and boldly proclaim that the Father's table of blessing is set and ready for whosoever will to freely receive. Healing Grace: Worthy to Receive? Healing Grace: Just Accept It?